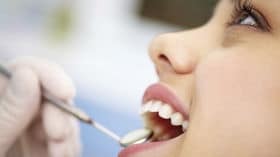 Home » What Is Gum Disease? Periodontal (or gum) disease is a bacterial infection that occurs under the gums and causes bleeding, pain, halitosis (bad breath) and bone loss from the jaws. If gum disease is more advanced, scaling and root planning can be performed to treat diseased periodontal pockets and gum infection. A dental hygienist uses an ultrasonic scaling device to remove plaque, tartar and food debris above and below the gum line, and hand scales the tooth and root surfaces to make them smooth and disease free. Periodontitis – At this stage, the supporting bone and fibres that hold the teeth in place are irreversibly damaged. The gums begin to form a pocket below the gum line, which encourages penetration and growth of plaque below the gum line. Professional periodontal therapy and improved personal oral hygiene can usually help prevent further damage to the gum tissue and supporting tissue and bone. Advanced Periodontitis – In this more advanced stage of gum disease, the fibres and bone of your teeth are being destroyed, which can cause your teeth to shift or loosen. This can affect your bite and how you eat and communicate. If aggressive periodontal therapy can’t save them, teeth may need to be removed by a dental specialist. At Dental 359 we will provide restorative options if teeth are removed due to periodontal disease.